Still hurting mightily from the 2016 election, Democrats pulled out all the stops to derail the nomination of Besty Devos as secretary of education. 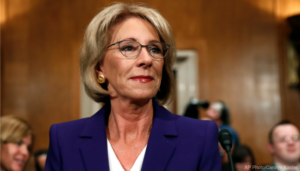 “The extraordinary battle over Betsy DeVos’s nomination … is the defining event of the Trump presidency’s early days,” Daniel Henninger wrote for the Wall Street Journal on Feb. 8. Every Democrat in the confirmation vote opposed DeVos, including Joe Manchin of West Virginia and Heidi Heitkamp of North Dakota. Vice President Mike Pence broke a 50-50 tie by voting in DeVos’s favor. Henninger noted that “the interests of the Democrats and the teachers unions are conjoined. Still, many of us have wondered at the party’s massive resistance to public-school alternatives and most reforms. Enrollment in urban schools is down significantly in Los Angeles, Philadelphia, Chicago, Detroit, Kansas City and other cities that have been under Democratic control for decades. “Falling alongside have been membership rolls in urban teachers unions, notably in Michigan and Wisconsin, two Trump pickups this election,” Henninger wrote. Flint, Michigan: 53 percent; Kansas City: 40 percent; Philadelphia: 32 percent; Washington, D.C.: 45 percent; Detroit: 53 percent. In Louisiana, which essentially abandoned its failed central-administration model after Hurricane Katrina, New Orleans charters are at 92 percent. “The steady migration of poor families to these alternatives is a historic saga of social transformation,” Henninger wrote. “It happened for two reasons: to escape public-school disorder and to give their kids a shot at learning. Henninger continued: “America’s inner cities are the foundation of the Democratic Party. Now, its urban political arm, the teachers unions, is shrinking. And its moral foundation of black parents is drifting away. Hillary Clinton explicitly promised more of the status quo. They didn’t turn out for her.